It is déjà vu all over again as the top-seeded and defending national champions Notre Dame Fighting Irish (32-3) and the No. 4 seed Texas A&M Aggies (26-7) meet in the regional semifinal round at Wintrust Arena on Saturday (3 p.m. CT, ESPN2). Here are my five things to watch for from Chicago. Chennedy Carter has taken the country by storm with an elite skillset as the sophomore guard is fresh off a 30-point, nine-rebound, five-assist outing in a 78-76 win over Marquette in the second round on March 24. Despite the elite performance, Carter’s pass to Shambria Washington with 22.9 seconds left in regulation proved to be the game-winner for the Aggies. Along with the game-winning pass, Texas A&M coach Gary Blair has seen a noticeable improvement with Carter’s defense this season. “The nine rebounds she got in the ball game is one of the main things that has made [Chennedy] a complete player,” Blair said. “Her defense was also outstanding in that ball game and we didn’t even talk about defense last season with her. Notre Dame forward Brianna Turner compared Carter’s game to Louisville’s Asia Durr. Few fans expected Texas A&M to be back in familiar territory after the off-season transfers of Anriel Howard (Mississippi State) and Danni Williams (Texas). The Aggies have been able to retool and return to form as Blair has done arguably his best coaching job yet. Aahliyah Jackson (shoulder) has been out for the last five weeks and will not play against Notre Dame, but even with everything outside the hardwood, Blair has maximized the core to a tee. While Notre Dame has coasted through the first two rounds of the tournament primarily through its offense with wins by an average of 35 points over Bethune-Cookman and Michigan State, defense has proven to be the backbone in the last week. It is not often when a rematch from the previous season’s regional semifinal occurs, but the Aggies and Irish meet once more as the latter will have a major homecourt advantage only 87.2 miles away from the South Bend campus. 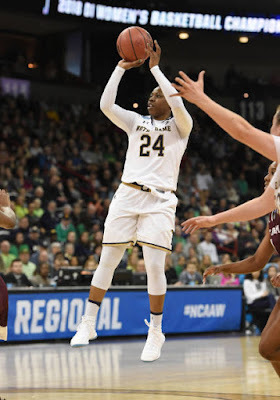 Arike Ogunbowale knows first-hand how the wear and tear of the travel schedule weighed on the Irish as they made a five-hour long flight to Spokane for last season’s meeting with the Aggies and is glad to be closer to home this time around. “It is amazing. We just had to hop on the bus rather than hop on a five-hour plane ride. It is nice that we are close to home instead,” Ogunbowale said. Texas A&M looked to be in prime position to upset Notre Dame in last season’s regional semifinal matchup as it led 37-24. Notre Dame’s rally towards to end of the second quarter carried into the second half as it completed the comeback and an eventual national championship. Blair looks to get another crack at the Irish, but knows it will take a 40-minute effort in order for the dream to become reality. “All we want is one more opportunity. Notre Dame is a better basketball team then they were last year when they won the national championship,” Blair said.